Matrix Multiplication In Java – Here, we will discuss the various methods on how to multiply two matrices using Java. The compiler has been added so that you can execute the given programs yourself, alongside suitable examples and sample outputs. Matrix multiplication is a simple binary operation that produces a single matrix from the entries of two given matrices. When two Matrices P & Q of order a*b and b*c are multiplied, the resultant matrix will be of the order a*c.
Here, the a entries across a row of P are multiplied with the b entries down a column of Q to produce the entry of PQ. The example given below explains the multiplication between two 2*2 matrices. 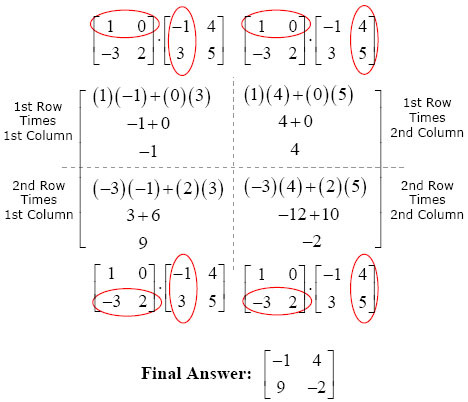 1) Condition for multiplication of two matrices is -1st matrix column number equal to 2nd matrix row number. b) Similarly insert the elements at matrix2 using 2 loops with the structures for (i=0;i<r2;i++ ),for (j= 0;j<c2;j++ ). 1) Read row, column numbers of the two matrices and checks the column number of matrix1 =row number of matrix2.If condition true then insert the elements into the matrices using while loop. While loop iterates until i <r1 condition is false. then j initialized to 0.
while loop iterates until the condition j<c1 is true. insert the element at mat1[i][j]. b) Similarly insert elements at matrix2 with the conditions i<r2,j<c2. while loop iterates until i<r1 is false. while loop iterates until j<c2 is false. while loop iterates until k<r2. insert sum value in to the resultant matrix at res[i][j]. 3) Print the matrix using while loops with the conditions i<r1, j<c2. 1) Multiply two matrices mat1,mat2, res is the resultant matrix. This loop iterates until k<r2 is false. Insert sum in to the resultant matrix at res[i][j],increase j value, then checks the condition j<c2. This loop iterates until j<c2 is false. Increase the i value, then checks the condition i<r1. This loop iterates until i<r1 is false.